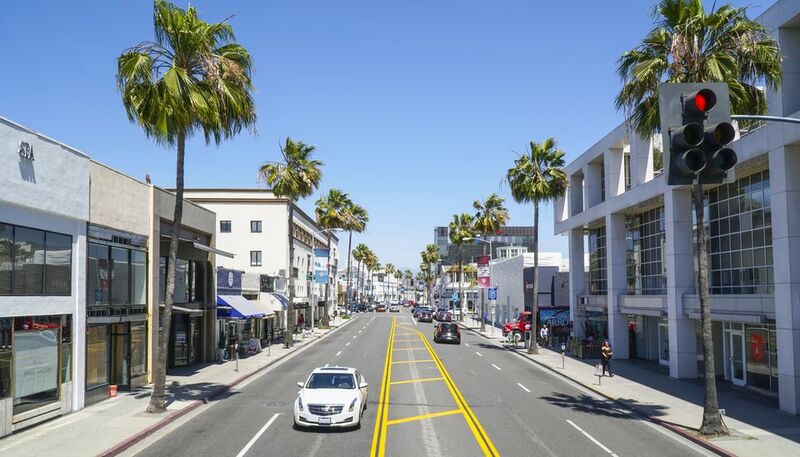 If you go to LA in April, you can enjoy some of the best weather of the year, with mostly cloudless skies and sunshine between the winter rainy season and the onset of summer fog. Tourist attractions get a breather between spring break and summer vacations, and you can enjoy them without tackling the crowds. Water temperature is still near winter lows, making getting into the ocean a bad idea, but you can still enjoy a walk at the beach. Most years, winter rains end by April. In an "El Niño" year, ocean currents bring California more rain than usual. When that happens, you might get wet until the middle of the month or later. Surprisingly, April is no sunnier than January (on the average) — but the days are longer. In some places, the weather is more or less the same as what the averages lead you to expect, with some variation. LA is not one of those places. You can use the averages above to get an idea of weather during your trip, but there's no substitute for checking the short-range forecast before you go. If you want to compare April weather to other months, check this guide to Los Angeles weather and climate. Vintage Bouquet Food and Wine Extravaganza: Beverly Hills' annual food and wine event deliver top quality sipping and nibbling — in gorgeous surroundings. Outdoor stations feature more than 50 exhibitors. They include some of Los Angeles' best restaurants, specialty food, vendors, wineries and non-alcoholic beverage makers. The associated silent auction gives you a chance to get something special for a great price. Proceeds support the Beverly Hills Bar Association's pro bono work. LA Brewery Art Walk: In what is considered the world's largest art complex; resident artists hold an open studio weekend. You can get a chance to speak to artists directly, purchase a fabulous new piece of art and even grab a bite to eat at the on-site restaurant. Toyota Grand Prix: It's a weekend-long event and the longest running major "street" race in North America, with the Indy-style cars racing not on a race track, but through the city streets. Classic Film Festival: This festival features screenings of classic films in some of the city's most beautiful old movie houses. Fiesta Broadway is the country's largest Cinco de Mayo celebration, a holiday that has become popular in the U.S. and celebrates the Mexican army's 1862 victory over France at the Battle of Puebla during the Franco-Mexican War. Taking over entire streets in downtown LA, this street fair has something for everyone. Live music, carnival games, plenty of authentic food, Latino artists, and vendors. Cinco de Mayo officially happens on May 5, but the festival takes place the last Sunday in April. For sports fans, baseball season opens in April for the Los Angeles Dodgers and Anaheim Angels. Check your favorite team's calendar for dates. March through August is time for something uniquely Southern California, the annual grunion run. Thousands of tiny, silver-colored fish spawn on the sand during the full moon (or the new one). See the current schedule on their website. At some Los Angeles beaches, "Grunion Greeters" are on hand to explain and help you get the most out of being there. In LA, you can see whales nearly year round: gray whales in winter and blue whales during the summer. Find the best places to see them and when in the guides to Los Angeles whale watching and Orange County whale watching. LA hotel rates are still going up despite all the new places to stay that have opened in recent years. In April, demand will be somewhat lower, and you may be able to find some bargains if you look.